Oxford University Press, USA, 9780195042313, 432pp. How have changes in media affected our everyday experience, behavior, and sense of identity? Such questions have generated endless arguments and speculations, but no thinker has addressed the issue with such force and originality as Joshua Meyrowitz in No Sense of Place. Advancing a daring and sophisticated theory, Meyrowitz shows how television and other electronic media have created new social situations that are no longer shaped by where we are or who is "with" us. -Leaders who try to act more like the "person next door" and real neighbors who want to have a greater say in local, national, and international affairs. 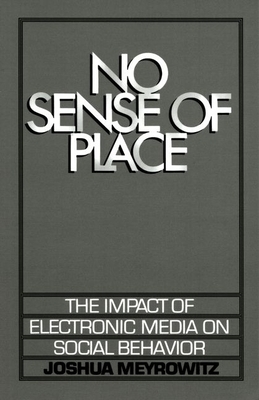 The dramatic changes fostered by electronic media, notes Meyrowitz, are neither entirely good nor entirely bad. In some ways, we are returning to older, pre-literate forms of social behavior, becoming "hunters and gatherers of an information age." In other ways, we are rushing forward into a new social world. New media have helped to liberate many people from restrictive, place-defined roles, but the resulting heightened expectations have also led to new social tensions and frustrations. Once taken-for-granted behaviors are now subject to constant debate and negotiation. The book richly explicates the quadruple pun in its title: Changes in media transform how we sense information and how we make sense of our physical and social places in the world. Joshua Meyrowitz is Professor of Communication at the University of New Hampshire, where he has won numerous honors, including the Lindberg Award for Outstanding Scholar-Teacher in the College of Liberal Arts. He is the author of scores of articles on media and society that have appeared in scholarly journals and anthologies, as well as in general-interest magazines and newspapers.